Perhaps you’ve heard of “gagaball?” It was new to me—but for the last couple of years the fellow who trains our lifeguards every summer has been STRONGLY encouraging me to get one. So this year, I did. And it’s a blast. Players enter the “pit.” A hexagon frame about two feet tall, 17’ across. Then they take this little ball, bounce it, then start to bat it around trying to hit the other players on the leg, from the knee down. You get hit below the knee, you’re out. Pretty simple. But the campers go crazy for it. One great thing about gaga is it is a self-policing game. Players know when they’re out, and they go out. Games rarely last more than 3 minutes. And they’re FUN! Today we celebrated the Fourth of July (on the 28th of June- I know! I know! But YOU try to get 21 trips in and out of camp in 21 days. The first Saturday of the term we have everyone in camp, so we do our All-Camp games) and it was a testament to the art of friendly competition. As you know, we divide all of camp in to two teams: the Army and the Navy. Once you’re on a team you’re on a team for LIFE. And so are all of your offspring. I’m a third generation Navy man myself. There really is no rhyme or reason for it- it’s just how we can divide into two teams for our all-camp competitions. So this morning we had our Army-Navy Track Meet. And it was a great one- it came down to a 25-point difference at the end—and with over 700 points at stake, that is a slim margin! We run, jump, put and throw- and here’s the thing. MOST of these guys have never competed in track events before. Many don’t even really know about them. So the amazing thing is when we see kids who have never run a 50-yard dash in their lives before run one and then WIN. And suddenly they have a whole perspective on what they can and can’t do. And maybe- just maybe this one win in this one event will change the shape of their lives forever. I know of more than a few Highlands men who learned to love the track and field thanks to their participation in our track meets here at camp. It’s a great event. It can make a hero out of anyone. And here is another thing I love about the track meet- at the end of the day we all just love to watch a good race. The Senior Relay is the big event at the end. When our fastest, oldest 4 guys from each team run about a 400-meter lap each. It is SO exciting- with everyone cheering for their team and shouting for their guy, and hoping for your team to pull through in the end. And sometimes they do! But sometimes they don’t. And today, what I loved seeing was that at the end of the big race, with all of camp gathered around hooting and hollering and shouting their teams, when the winner crossed that finish line -he stopped. And waited. And the first hand he grabbed was the guy he just beat. Then all of the relay guys gathered around, from both teams, and shared a smile and a hug for a race well run- and suddenly we weren’t Army or Navy anymore. We were Highlands. They did this with no prompting from a counselor. They did it because that’s how we do it at Highlands. This is the art of friendly competition. And it was on proud display today. It was a great day at camp. Sometimes I take the little things for granted. And then something as simple as watching a flock of boys run past me will remind me of just how special summer camp can be. This morning I had one of those moments. I was sitting on the office porch enjoying one last cup of coffee before the onslaught of the day, and the bugle blew- and there they were- a flock of Cubbies clomping past the porch on their way to their activities. Running. I don’t know what it is about these little guys, but it seems like they are always in a rush to the next great adventure. They greet the day with enthusiasm and pep (Honor Camper Quality #3), and they don’t let a moment go to waste. Some of that zest probably comes from the compressed energy of the last two days. Long car or plane rides. A forever-taking bus. Then all those safety talks! Riflery, Waterfront, Boating Bay, Free Swim. Then the instructional talks- how to be a waiter, how to request an activity, how to put up a tent, how to sweep the cabin, how to make a bed! And then the swim test! And then the bad weather drill! It’s no wonder they’re ready to rock on this second day at camp. 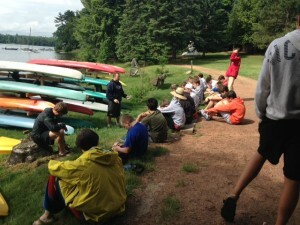 Waterfront safety talk. Boring? Maybe. Important? You bet! Ross gives the thumbs up after a successful storm drill. Boring? Perhaps. Important? Definitely! But all this preparation is what makes for an exciting and a safe summer. So today, it is time to RUN. 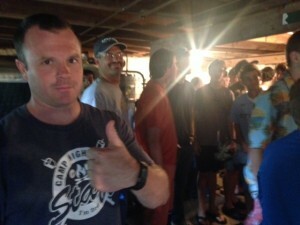 The fellas in Cabin 24 told me they have the BEST day today. Kayaking, Archery, Adventure (our ropes course) and Riflery. Then they couldn’t wait for Clubs this afternoon. Two will be making model rockets. Two have signed up for our Soccer tournament. All four were brimming with enthusiasm and excitement for this great adventure called “camp.” And all four were running all around, with nobody telling them to stand still or calm down or be quiet or act right. Because they were acting right! They were boys, being boys. I can’t remember the last time I ran just for running’s sake, but next time I see that flock of Cubbies blazing by, I think I will join them. The makings for the perfect start to camp? Check. Sun? Check. White puffy clouds? Check. A gentle breeze on the lake? Check. All travel plans go off without a hitch? Check. What a way to start the summer. I am happy to report that the buses have arrived and the 2014 season is underway. What happens when two motor coaches filled with excited boys unload on Highlands property? It’s a miracle, actually. Bugles blow to welcome the buses in and campers pile off the buses to be greeted by the boys who arrived by car and our staff. 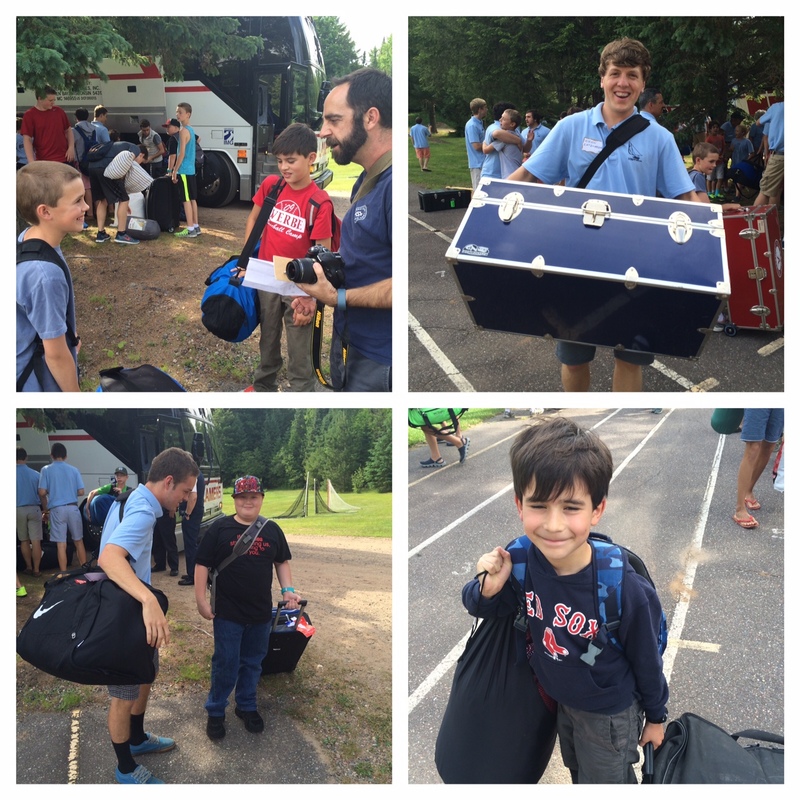 Trunks, duffel bags, tennis racquets and lacrosse sticks are distributed and toted off to their cabins. Beds are quickly made, and at 5:50 the bugle calls for supper. Lois has had the water on to boil since lunchtime, at just the right moment she’ll drop 20 pounds of pasta (!!) in and spaghetti dinner will be served, hot and delicious. After supper, the boys will play games, get a tour of camp and learn some baseline rules while they sit around the first of many campfires for the summer. We are so excited to have your sons with us. After all the forms you’ve filled out and socks you’ve labeled (you DID label their socks, right? ), I might guess that you are feeling all sorts of things right now. Will he like his bunkmates? Will he eat the food? Will he drink too much bug juice? After 111 summers, there’s a little miracle that happens at Highlands. Things just sort themselves out after a few days. Both for you and for your boys! We have put together a fantastic staff who are trained to nurture, teach and guide your sons. We have a dedicated kitchen staff that’s making delicious food from scratch. And you have Andy, Tracy, Mike and Sharon Bachmann whose primary concern in life is making this experience the absolute best possible for your child. Thank you for sending them to us. It’s our honor to have them for this amazing 111th summer! You send your kid *where* for the summer? When you start missing your boy, just imagine him sitting right here! Adorable mom: So what are your summer plans? Me: We do this *camp* thing. 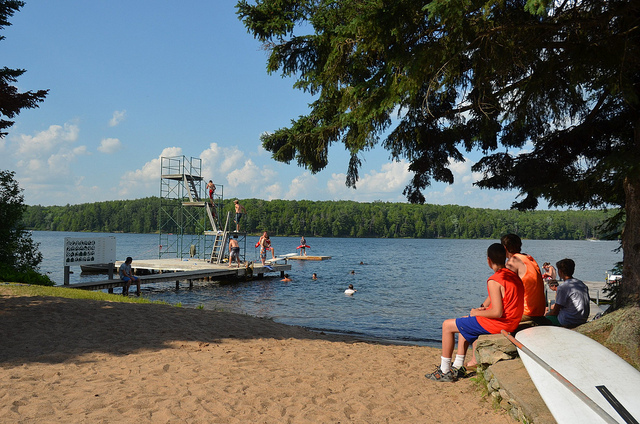 You know, oldest private boys camp in the country, northern Wisconsin, 111 summers, fourth generation, husband’s family, etc. [this is the abbreviated version] AM: Wooowww. That’s so cool! How many boys do you guys have? Me: 110 or so per session. We have two sessions, a three week and a four week and many boys go for all seven. AM: [look of terror crosses her face] Woah…four weeks? I could never send Howie away for four weeks. [Ok, almost no one is named Howie, I totally made that name up.] Well, I could see how your son could do it, since you guys are there all summer with him. What do your girls do while you’re there? Me: Well, the baby is with a babysitter during the day, but our nine year old daughter goes to girl’s camp for four weeks. AM: (GASP + look of terror) Four weeks! Don’t you miss her? Doesn’t she get homesick? Me: I miss her like crazy! But after the first week, I adjust. She was homesick for the first week last year and we got the sweetest, most hysterical letters from her. But after that first week, we hardly heard a word from her. I figure it’s great practice for college. Plus, it’s been such a confidence builder for her. I can’t tell you how proud of herself she was when she came home. School isn’t her favorite, but camp, man, she’d live there year-round if she could. She is so excited she gets to take skiing this year! AM: (considers this) Hmmm. Skiing? That’s really, really cool. You know, my dad went to summer camp in New York when he was a boy. What’s your website address again? Moms and dads, you guys are doing a BRAVE thing. You are sending your child off to camp this summer. To a place that may or may not be known to you. We’ve said it before and we’ll say it again: it’s fierce. Remind yourself and your son that this a bold adventure and that, yes!, he might be homesick, and yes!, you’ll miss him. But he’s going to have so.much.fun. He’s going to learn.so.much. And you’ll all come out on the other side, counting down the days until next summer.